This delicate and sweet drink would compliment a weekend brunch or afternoon soiree. Moscato d’Asti is a sparkling white wine; it’s similar to champagne, but sweeter and slightly less bubbly. The alcohol content is half that of a normal table wine, making it appropriate for daytime celebrations. When paired with raspberries soaked in crème de cassis (blackcurrant liquer), the drink takes on a delicious flavor and a lovely reddish hue. 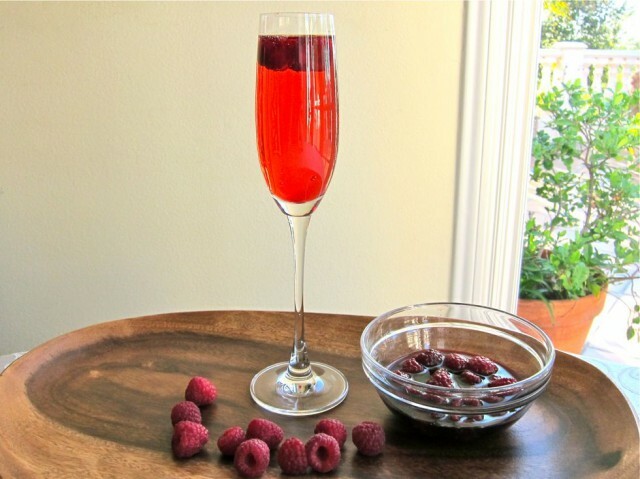 A delicate sweet cocktail made with Crème de Cassis, Moscato d’Asti, and fresh raspberries. Kosher. Rinse raspberries and pat dry, then place them in a small bowl. Cover them with the crème de cassis. Let the raspberries macerate in the liquor for 20-30 minutes. Line up 6 chilled champagne flutes. Place 3 marinated raspberries into each flute along with 1 ½ tsp crème de cassis. Top off each champagne flute with cold Moscato d’Asti. Serve immediately. Another great cocktail. Thanks Tori! I noticed that recommended Rashi Moscato d’Asti. I found a Moscato at Trader Joe’s OU kosher and kosher for Passover. It was about $6.